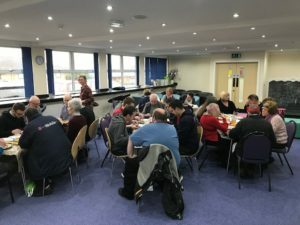 On Wednesday January 24th 2018 we held our ‘Volunteers Christmas Meal’. We can’t hold the meal before Christmas because we are so busy with collections and deliveries. We cooked roast chicken and crumble for 30 of our warehouse volunteers and enjoyed a quiz written by one of our volunteers. It was a lovely afternoon and it was a small way of saying a big thank you to our volunteers who give so much to BCFB.